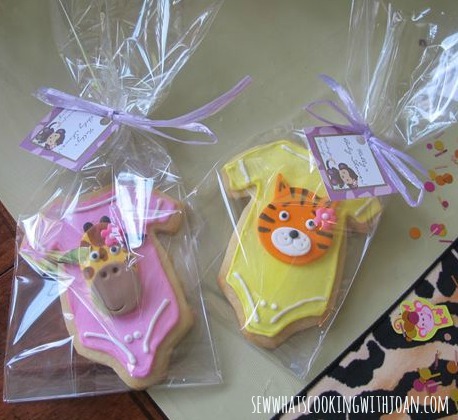 As promised -here is part two of Tink's jungle animal themed baby shower. 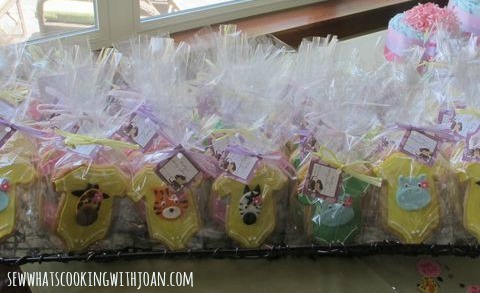 This post is to share with you all the jungle animal onesie cookies I made as favors. I bought the fondant jungle animal toppers from a gal on Etsy. One of these days I would love to teach myself how to work with fondant, but because there were so many other details to attend to, I made it easy on myself. Plus, I could not resist buying from these talented women on Etsy who make all sorts of adorable toppers! It took me 2 days to make and package these cookies. I was able to bake, pipe and flood all in one day. On the second day, I piped the shirt sleeves and bottoms in white and used corn syrup to attach the jungle animals to the cookies. 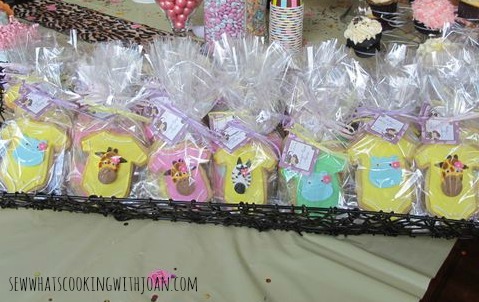 You can use the onesie cookie cutter for any type of baby shower theme. You could also use the toppers on cupcakes if you didn't feel like doing the cookie project. I used three different colors for the base of the onesies', which matched Tink's nursery colors. I'm sorry the pictures aren't better! They came out a little blurry when I enlarged them, but I really wanted you guys to see them up close. Well, wishing you guys a great upcoming weekend! I will be back on Monday with our monthly SRS (secret recipe swap). Come back then! A Pillow Trick! Jacob's pillow! How to carve a watermelon baby carriage! May SRS -Black Bean Avocado Quesadillas! Tink's Jungle Themed Baby Shower! Pancetta crisp with apple and gorgonzola!